Since 1993, we applied laparoscopy assisted gastrectomy for gastric cancer and 195 patients were treated until@August, 2007. Laparoscopy assisted distal gastrectomy (LADG) was performed in 150 cases, total gastrectomy in 12 cases, partial gastrectomy in 14 cases and proximal gastrectomy (LAPG) in 19 cases. The indication of LAPG was limited early gastric cancer in upper 1/3 of the stomach. Esophago-gastrostomy was performed in 13 cases in whom resected stomach was within 1/3 and jejunal pouch was interposed in 6 cases who received over1/3 of the stomach. The average operation time was 180 minutes in esophago-gastrostimy cases and 300minutes in jejunal interposed cases. There is no anastomotic leakage, however anastomotic stricture occurred in only one patient (6%) who received successful endoscopic dilatation. 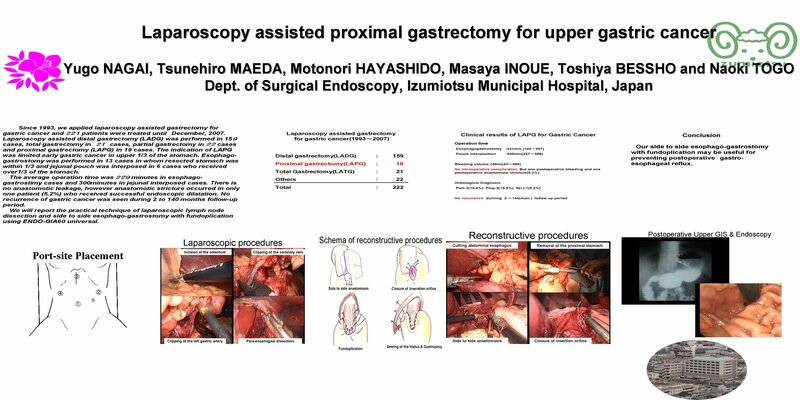 No recurrence of gastric cancer was seen during 2 to 140 months follow-up period.We will report the practical technique of laparoscopic lymph node dissection and side to side esophago-gastrostomy using ENDO-GIA60 universal.